Kyle Busch hoisted a Miles the Monster trophy for the second time in 24 hours as he celebrated his 66th Nationwide Series victory in 280 starts. Busch joked that he has two big Monster trophies, which he called the mom and dad, and a bunch of “kid” ones, meaning the truck and NNS trophies, which are smaller. 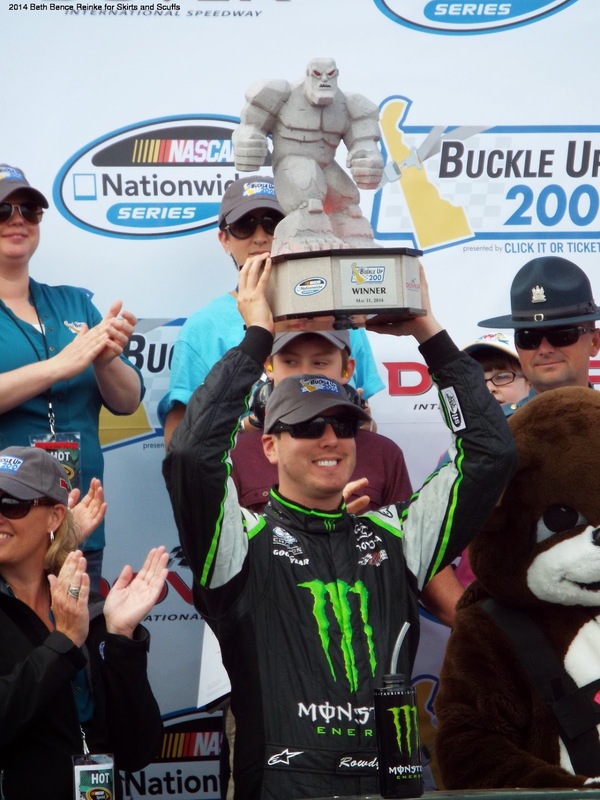 The historic win makes Busch the first driver to win both the NASCAR Camping World Truck Series and Nationwide Series at Dover in one weekend. He’s also the only driver to sweep all three NASCAR national series in a single weekend -- Bristol in 2010. When asked if concrete tracks seem to work for him, Busch said he’s good at places like Bristol, Dover and Nashville. Busch said he probably considers the sweep at Bristol at the top of his list of racing accomplishments, and compared it to a possible sweep at Dover. The day didn't go as well for polesitter Joey Logano. His streak of four consecutive Nationwide wins at Dover ended when he finished third. Trevor Bayne came close to catching Busch but could not quite get to him in time. His second-place finish was Bayne's second top-five of the season. And although Regan Smith came home 10th, he retained the Nationwide Insurance series points lead by four over ninth-place finisher Elliott Sadler and 22 over rookie Chase Elliott, who ended up fifth.